A mid-air scare after his plane developed a technical snag has forced Congress president Rahul Gandhi to vow to undertake the arduous Kailash Mansarovar trek after the Karnataka elections. Speaking to party workers and leaders while launching the Jan Aakrosh Rally in Delhi, the Congress president said that once he feared that his plane is going to crash, he thought of visiting Kailash Mansarovar. The self-claimed 'Shiv Bhakt' will now travel to the mountain that is the mythical abode of Hindu deity Shiva, which many see as yet another attempt by the Congress president of indulging in soft Hindutva politics before the crucial assembly elections in Madhya Pradesh, Rajasthan and Chhattisgarh to counter the Bharatiya Janata Party's aggressive Hindutva agenda in these states. Earlier, Rahul had embarked on several visits to temples in the run-up to Assembly elections in Gujarat, which political pundits believed did help the Congress in putting up a brave fight against the BJP in Prime Minister Narendra Modi's home state. After its improved performance in Gujarat, Rahul adopted a similar strategy in Karnataka where he was seen visiting multiple temples and mutts in what many think was yet another attempt at playing the soft hindutva card to woo the majority community voters to its fold in this do or die battle. With only 11 days left before the southern state goes to polls, it still remains a mystery whether the gamble to woo the voters with temple runs have succeeded in giving the party an edge over its saffron rivals. 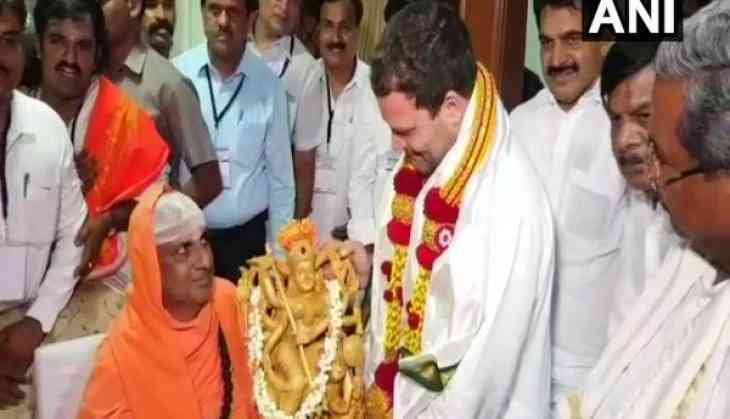 Experts believe that unlike Gujarat, there has been negligible impact of his visits to temples with some even questioning Rahul being a factor in the upcoming polls. “It is having no impact whatsoever because voters are well aware that Congress is more secular compared with the BJP. Congress has had a long history, starting with Nehru's idea of secularism and people are aware of Congress' Nehruvian cultural practices. Sonia Gandhi did say that we are victims of appeasement, which is leading to identity markers becoming problems for political parties. It does not bode well for our democracy,” said Prof Muzzaffar Assadi, who teaches Political Science at Mysuru University. According to him, Rahul's visit to temples and mutts in just ritual symbolism and should not be mistaken with soft hindutva. “Ritual symbolism doesn't carry the meaning of hate or communalism which soft Hindutva to an extent does. There is a consensus amongst voters in Karnataka that Congress is trying to woo them through ritual symbolism and not soft Hindutva. Soft Hindutva must have worked in Gujarat but no one in Karnataka bothers about it,” he added. Meanwhile, Professor Narendar Pani, who teaches Political Science at the National Institute of Advanced Studies in Bengaluru, disagreed with Congress indulging in soft Hindutva politics in the state. According to him, former Prime Ministers Indira Gandhi and Rajiv Gandhi often visited temples and mutts in the state and that there is nothing new to what Rahul is doing. “It's only the media that is labelling such visits as soft Hindutva. These visits are nothing but reactions to Congress being portrayed as an anti-Hindu party. Soft Hindutva has no role in Karnataka and elections are being fought on local issues. I don't know whether Rahul is even a factor in these elections,” Pani pointed. According to him, the logic of it working in Gujarat cannot be applied here in Karnataka. “The same brush can't be used for every state. It might have worked in Gujarat but not in Karnataka,” Pani said while pointing that Rahul has also visited several dargahs in the state and no one seems to be bringing that up. Interestingly, a Congress leader from the state concurred that these temple visits seem to have created a negative impact on some of the party's traditional voters. Speaking on the request of anonymity, he said, “We were Hindu earlier as well so why this need to prove that we are more Hindu now. This is making some traditional voters angry because they are asking: Were they not Hindus when they won in the past? Why do you have to prove that you are a Hindu now. Visiting temples and mutts has been there for ages in the Gandhi family,” he said. According to him, the party has fallen in the trap laid out by the BJP, which has succeeded in saying that Gandhis are not Hindus. “We are all Hindus so where does the question even arrive? Only that will help us in winning elections would be a pro-poor image. They should realise that they can't fight BJP on the Hindutva plank,” he added. Amid all this, there are also talks of Muslims feeling alienated by Congress' move of playing the soft Hindutva card and could possibly support another party. Assadi dismissed such claims and asserted that Muslims, who form 18% of the population, feel that the BJP remain their No 1 enemy. “They have this fear that if BJP wins yet another term at the state and the Center, their personal and physical security is at stake. In Karnataka, the perception is that if BJP comes to power, it could be the end of their community's freedom, cultural practices, among others. Such fear psychosis has been created in the state. BJP is seen more as a monster than a political entity,” Assadi added. Even Congress leader echoes similar views and said that the community will vote for the Congress en-masse. According to him, once Modi begins his visit to the state, the bond between Congress and Muslims would strengthen further.